New Trends or Just Good Designs? While most instructional design courses and much of the instructional design industry focuses on ADDIE, approaches such as design thinking, human-centered design, and agile methods like SAM (Successive Approximation Model)—have drawn attention. This chapter unpacks what we know about design thinking and presents a concise history of design thinking to situate it within the broader design research field and then traces its emergence in other fields. I consider lessons for instructional designers and conclude by raising concerns for scholarship and teaching—and thereby practice—and set an agenda for addressing these concerns. Many depictions of design process, and a majority of early design learning experiences, depict design as rather linear—a “waterfall” view of design (Figure 1). This depiction was put forward as a flawed model (Royce, 1970), yet it is relatively common. It also contrasts what researchers have documented as expert design practice. Design thinking seems both useful and cool, but I have to practice a more traditional approach like ADDIE or waterfall. Can I integrate agile methods and design thinking into my practice? Design thinking—particularly the work by IDEO—is inspiring. As an instructional designer, can design thinking guide me to create instructional designs that really help people? Given that design thinking seems to hold such potential for instructional designers, I want to do a research study on design thinking. Because it is still so novel, what literature should I review? As a designer, I sometimes get to the end of the project, and then have a huge insight about improvements. Is there a way to shift such insights to earlier in the process so that I can take advantage of them? If design thinking and agile design methods are so effective, why aren’t we taught to do them from beginning? To answer these questions, I explore how research on design thinking sheds light on different design methods, considering how these methods originated and focusing on lessons for instructional designers. I then share a case to illustrate how different design methods might incorporate design thinking. I close by raising concerns and suggesting ways forward. There is no single, agreed-upon definition of design thinking, nor even of what being adept at it might result in, beyond good design (Rodgers, 2013), which is, itself, subjective. If we look at definitions over time and across fields (Table 1), we see most researchers reference design thinking as methods, practices or processes, and a few others reference cognition or mindset. This reflects the desire to understand both what it is that designers do and how and when they know to do it (Adams, Daly, Mann, & Dall’Alba, 2011). Some definitions emphasize identity (Adams et al., 2011), as well as values (e.g., practicality, empathy) (Cross, 1982). In later definitions, design thinking is more clearly connected to creativity and innovation (Wylant, 2008); we note that while mentioned in early design research publications (e.g., Buchanan, 1992), innovation was treated as relatively implicit. “how designers formulate problems, how they generate solutions, and the cognitive strategies they employ.” These include framing the problem, oscillating between possible solutions and reframing the problem, imposing constraints to generate ideas, and reasoning abductively. “a mindset.” It is human-centered, collaborative, optimistic, and experimental. These include switching between design tasks and working iteratively. For another great summary of various approaches to design thinking, see this article by the Interaction Design Foundation. This foundation has many other interesting articles on design that would be good reading for an instructional design student. Where Did Design Thinking Come From? What Does It Mean for Instructional Designers? Design thinking emerged from the design research field [#footnote-1448-1]—an interdisciplinary field that studies how designers do their work. Initially, design thinking was proposed out of a desire to differentiate the work of designers from that of scientists. As Nigel Cross explained, “We do not have to turn design into an imitation of science, nor do we have to treat design as a mysterious, ineffable art” (Cross, 1999, p. 7). By documenting what accomplished designers do and how they explain their process, design researchers argued that while scientific thinking can be characterized as reasoning inductively and deductively, designers reason constructively or abductively (Kolko, 2010). When designers think abductively, they fill in gaps in knowledge about the problem space and the solution space, drawing inferences based on their past design work and on what they understand the problem to be. Research on design thinking should inspire us to critically consider how we use precedent to fill in gaps as we design. Precedent includes our experiences as learners, which may be saturated with uninspired and ineffective instructional design. A critical difference between scientific thinking and design thinking is the treatment of the problem. Whereas in scientific thinking the problem is treated as solvable through empirical reasoning, in design thinking problems are tentative, sometimes irrational conjectures to be dealt with (Diethelm, 2016). This type of thinking has an argumentative grammar, meaning the designer considers suppositional if-then and what-if scenarios to iteratively frame the problem and design something that is valuable for others (Dorst, 2011). As designers do this kind of work, they are jointly framing the problem and posing possible solutions, checking to see if their solutions satisfy the identified requirements (Cross et al., 1992; Kimbell, 2012). From this point of view, we don’t really know what the design problem is until it is solved! And when doing design iteratively, this means we are changing the design problem multiple times. But how can we manage such changes efficiently? One answer is agile design. while the existing discipline of software engineering has no way of dealing with this systematically” (Floyd, 1988, p. 25). With the influence new technologies were having on educational settings, it was natural that instructional designers might look to software design for inspiration. Indeed, Tripp and Bichelmeyer introduced instructional designers to rapid prototyping methods while these same methods were still being developed in the software design field (1990). They explained that traditional ID models were based on “naive idealizations of how design takes place,” (p. 43), and that ID practice already included similar approaches (e.g., formative evaluation and prototyping), suggesting that agile design could be palatable to instructional designers, particularly when the context or learning approach is relatively new or unfamiliar. Our instructional designs tend to be short lived in use, making them subject to iteration and adaptation to meet emergent changes. Each new solution is linked to a reframing of the problem. As agile designers, we can embrace this iteration agentively, reframing the problem as we work based on insights gained from testing early, low fidelity prototypes with stakeholders. As practiced, agile methods, including SAM (Allen, 2012) and user-centered design (Norman & Draper, 1986), bring the end user into the design process frequently (Fox, Sillito, & Maurer, 2008). Working contextually and iteratively can help clients see the value of a proposed design solution and understand better how—and if—it will function as needed (Tripp & Bichelmeyer, 1990). Other design methods that engage stakeholders early in the design process, such as participatory design (Muller & Kuhn, 1993; Schuler & Namioka, 1993) and human-centered design (Rouse, 1991) have also influenced research on design thinking. While these approaches differed in original intent, these differences have been blurred as they have come into practice. Instead of defining each, let’s consider design characteristics made salient by comparing them with more traditional, linear methods. Like agile design, these methods tend to be iterative. They also tend to bring stakeholders into the process more deeply to better understand their experiences, extending the approach taken in ADDIE, or even to invite stakeholders to generate possible design ideas and help frame the design problem. When designing with end-users, we get their perspective and give them more ownership over the design, but it can be difficult to help them be visionary. As an example, consider early smartphone design. Early versions had keyboards and very small screens and each new version was incrementally different from the prior version. If we had asked users what they wanted, most would have suggested minor changes in line with the kinds of changes they were seeing with each slightly different version. Likewise, traditional approaches to instruction should help inspire stakeholder expectations of what is possible in a learning design. Inviting stakeholders into instructional design process early can lead to more successful designs, but we should be ready to support them to be visionary, while considering how research on how people learn might inform the design. 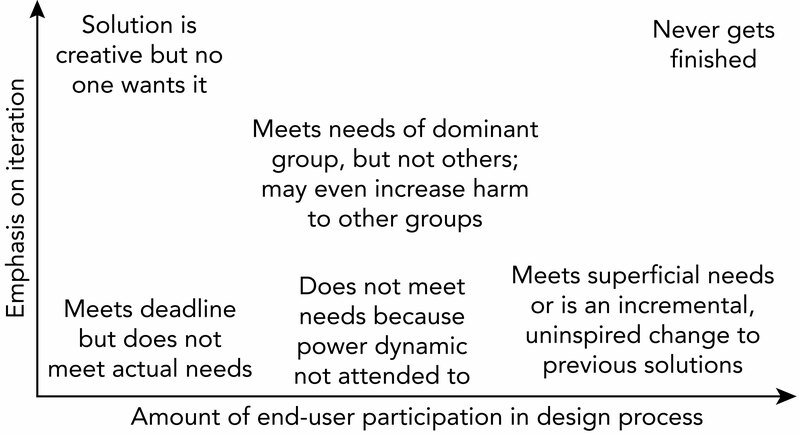 Designers who engage with end-users must also attend to power dynamics (Kim, Tan, & Kim, 2012). As instructional designers, when we choose to include learners in the design process, they may be uncertain about how honest they can be with us. This is especially true when working with children or adults from marginalized communities or cultures unfamiliar to us. For instance, an instructional designer who develops a basic computer literacy training for women fleeing abuse may well want to understand more about learner needs, but should consider carefully the situations in which learners will feel empowered to share. With a focus on understanding human need, design thinking and agile methods should also draw our attention to inclusivity, diversity, and participant safety. We next turn to an example, considering what design thinking might look like across different instructional design practices. A client—a state agency—issued a call for proposals that addressed a design brief for instructional materials paired with new approaches to assessment that would be “worth teaching to.” They provided information on the context, learners, constraints, requirements, and what they saw as the failings of current practice. They provided evaluation reports conducted by an external contractor and a list of 10 sources of inspiration from other states. They reviewed short proposals from 10 instructional design firms. In reviewing these proposals, they noted that even though all designers had access to the same information and the same design brief, the solutions were different, yet all were satisficing, meaning they met the requirements without violating any constraints. They also realized that not only were there 10 different solutions, there were also 10 different problems being solved! Even though the client had issued a design brief, each team defined the problem differently. The client invited four teams to submit long proposals, which needed to include a clear depiction of the designed solution, budget implications for the agency, and evidence that the solution would be viable. Members of these teams were given a small budget to be spent as they chose. Team Waterfall, feeling confident in having completed earlier design steps during the short proposal stage, used the funds to begin designing their solution, hoping to create a strong sense of what they would deliver if chosen. They focused on details noted in the mostly positive feedback on their short proposal. They felt confident they were creating a solution that the client would be satisfied with because their design met all identified requirements, because they used their time efficiently, and because as experienced designers, they knew they were doing quality, professional design. Team Waterfall treated the problem as adequately framed and solved it without iteration. Designers often do this when there is little time or budget [#footnote-1448-2], or simply because the problem appears to be an another-of problem—“this is just another of something I have designed before.” While this can be an efficient way to design, it seldom gets at the problem behind the problem, and does not account for changes in who might need to use the designed solution or what their needs are. Just because Team Waterfall used a more linear process does not mean that they did not engage in design thinking. They used design thinking to frame the problem in their initial short proposal, and then again as they used design precedent—their past experience solving similar problems—to deliver a professional, timely, and complete solution. Team ADDIE used the funds to conduct a traditional needs assessment, interviewing five stakeholders to better understand the context, and then collecting data with a survey they created based on their analysis. They identified specific needs, some of which aligned to those in the design brief and some that demonstrated the complexity of the problem. They reframed the problem and created a low fidelity prototype. They did not have time to test it with stakeholders, but could explain how it met the identified needs. They felt confident the investment in understanding needs would pay off later, because it gave them insight into the problem. Team ADDIE used design thinking to fill gaps in their understanding of context, allowing them to extend their design conjectures to propose a solution based on a reframing of the design problem. Team Agile used the budget to visit three different sites overseen by the state agency. They shared a low fidelity prototype with multiple stakeholders at the first site. In doing so, they realized they had misunderstood key aspects of the problem from one small but critical stakeholder group. They revised both their framing of the problem and their idea about the solution significantly and shared a revised prototype with stakeholders at the remaining sites. They submitted documentation of this process with their revised prototype. Team Agile prioritized iteration and diversity of point of view in their work. They committed to treating their solution ideas as highly tentative, but gave stakeholders something new and different to react to. This strategy helped the team reframe the problem, but could have failed had they only sought feedback on improvements, rather than further understanding of the problem. They used design thinking to reframe their understanding of the problem, and this led them to iterate on their solution. Design researchers describe this as a co-evolutionary process, in which changes to the problem framing affect the solution, and changes to the solution affect the framing (Dorst & Cross, 2001). Team Human-centered used the budget to hold an intensive five-day co-design session with a major stakeholder group. Stakeholders shared their experiences and ideas for improving on their experience. Team Human crafted three personas based on this information and created a prototype, which the stakeholder group reviewed favorably. They submitted this review with their prototype. Team Human-centered valued stakeholder point of view above all else, but failed to consider that an intensive five-day workshop would limit who could attend. They used design thinking to understand differences in stakeholder point of view and reframed the problem based on this; however, they treated this as covering the territory of stakeholder perspectives. They learned a great deal about the experiences these stakeholders had, but failed to help the stakeholders think beyond their own experiences, resulting in a design that was only incrementally better than existing solutions and catered to the desires of one group over others. The case above depicts ways of proceeding in design process and different ways of using design thinking. These characterizations are not intended to privilege one design approach over others, but rather to provoke the reader to consider them in terms of how designers fill in gaps in understanding, how they involve stakeholders, and how iteratively they work. Each approach, however, also carries potential risks and challenges (Figure 2). For instance, designers may not have easy access to stakeholders, and large projects may make agile approaches unwieldy to carry out (Turk, France, & Rumpe, 2002). While originally a construct introduced by design researchers to investigate how designers think and do their work, design thinking became popularized, first in the business world (Brown, 2008) and later in education. Given this popularity, design thinking was bound to draw critique in the public sphere. To understand these critiques, it is worth returning to the definitions cited earlier (Table 1). Definitions outside of the design research field tend to be based in specific techniques and strategies aimed at innovation; such accounts fail to capture the diversity of actual design practices (Kimbell, 2011). They also tend to privilege the designer as a savior, an idea at odds with the keen focus on designing with stakeholders that is visible in the design research field (Kimbell, 2011). As a result, some have raised concerns that design thinking can be a rather privileged process—e.g., upper middle class white people drinking wine in a museum while solving poverty with sticky note ideas—that fails to lead to sufficiently multidimensional understandings of complex processes (Collier, 2017). Still others argue that much of design thinking is nothing new (Merholz, 2009), to which researchers in the design research field have responded: design thinking, as represented externally might not be new, but the rich body of research from the field could inform new practices (Dorst, 2011). These critiques should make us cautious about how we, as instructional designers, take up design thinking and new design practices. Below, I raise a few concerns for new instructional designers, for instructional designers interested in incorporating new methods, for those who teach instructional design, and for those planning research studies about new design methods. My first concern builds directly on critiques from the popular press and my experience as a reviewer of manuscripts. Design thinking is indeed trendy, and of course people want to engage with it. But as we have seen, it is also complex and subtle. Whenever we engage with a new topic, we necessarily build on our past understandings and beliefs as we make connections. It should not be surprising, then, that when our understanding of a new concept is nascent, it might not be very differentiated from previous ideas. Compare, for example, Polya’s “How to Solve it” from 1945 to Stanford’s d.school representation of design thinking (Table 2). While Polya did not detail a design process, but rather a process for solving mathematics problems, the two processes are superficially very similar. These general models of complex, detailed processes are zoomed out to such a degree that we lose the detail. These details matter, whether you are a designer learning a new practice or a researcher studying how designers do their work. For those learning a new practice, I advise you to attend to the differences, not the similarities. For those planning studies of design thinking, keep in mind that “design thinking” is too broad to study effectively as a whole. Narrow your scope and zoom in to a focal length that lets you investigate the details. As you do so, however, do not lose sight of how the details function in a complex process. For instance, consider the various approaches being investigated to measure design thinking; some treat these as discrete, separable skills, and others consider them in tandem (Carmel-Gilfilen & Portillo, 2010; Dolata, Uebernickel, & Schwabe, 2017; Lande, Sonalkar, Jung, Han, & Banerjee, 2012; Razzouk & Shute, 2012). My second concern is that we tend, as a field, to remain naïve about the extant and extensive research on design thinking and other design methods, in part because many of these studies were conducted in other design fields (e.g., architecture, engineering) and published in journals such as Design Studies (which has seldom referenced instructional design). Not attending to past and current research, and instead receiving information about alternative design methods filtered through other sources is akin to the game of telephone. By the time the message reaches us, it can be distorted. While we need to adapt alternative methods to our own ID practices and contexts, we should do more to learn from other design fields, and also contribute our findings to the design research field. As designers, we would do well to learn from fields that concern themselves with human experience and focus somewhat less on efficiency. My third concern is about teaching alternative design methods to novice designers. The experience of learning ID is often just a single pass, with no or few opportunities to iterate. As a result, agile methods may seem the perfect way to begin learning to design, because there is no conflicting traditional foundation to overcome. However, novice designers tend to jump to solutions too quickly, a condition no doubt brought about in part by an emphasis in schooling on getting to the right answer using the most efficient method. Methods like agile design encourage designers to come to a tentative solution right away, then get feedback by testing low fidelity prototypes. This approach could exacerbate a new designer’s tendency to leap to solutions. And once a solution is found, it can be hard to give alternatives serious thought. Yet, I argue that the solution is not to ignore agile and human-centered methods in early instruction. By focusing only on ADDIE, we may create a different problem by signaling to new designers that the ID process is linear and tidy, when this is typically not the case. Instead, if we consider ADDIE as a scaffold for designers, we can see that its clarity makes it a useful set of supports for those new to design. Alternative methods seldom offer such clarity, and have far fewer resources available, making it challenging to find the needed supports. To resolve this, we need more and better scaffolds that support novice designers to engage in agile, human-centered work. For instance, I developed a Wrong Theory Design Protocol (https://edtechbooks.org/-ub) that helps inexperienced designers get unstuck, consider the problem from different points of view, and consider new solutions. Such scaffolds could lead to a new generation of instructional designers who are better prepared to tackle complex learning designs, who value the process of framing problems with stakeholders, and who consider issues of power, inclusivity, and diversity in their designing. I encourage novice instructional designers, as they ponder the various ID models, approaches, practices and methods available to them, to be suspicious of any that render design work tidy and linear. If, in the midst of designing, you feel muddy and uncertain, unsure how to proceed, you are likely exactly where you ought to be. Does its effectiveness depend significantly on having compliant learners who do everything asked of them without questioning why they are doing it? Is it a design worth engaging with? Would you want to be the learner? Would your mother, child, or next-door neighbor want to be? If yes on all counts, consider who wouldn’t, and why they wouldn’t. Is the design, as one of my favorite project-based teachers used to ask, “provocative” for the learners, meaning, will it provoke a strong response, a curiosity, and a desire to know more? Is the design “chocolate-covered broccoli” that tricks learners into engaging? To be clear, the goal is not to make all learning experiences fun or easy, but to make them worthwhile. And I can think of no better way to ensure this than using iterative, human-centered methods that help designers understand and value multiple stakeholder perspectives. And if, in the midst of seeking, analyzing, and integrating such points of view, you find yourself thinking, “This is difficult,” that is because it is difficult. Providing a low fidelity prototype for stakeholders to react to can make this process clearer and easier to manage, because it narrows the focus. However, success of this approach depends on several factors. First, it helps to have forthright stakeholders who are at least a little hard to please. Second, if the design is visionary compared to the current state, stakeholders may need to be coaxed to envision new learning situations to react effectively. Third, designers need to resist the temptation to settle on an early design idea. Finally, I encourage instructional designers—novice and expert alike—to let themselves be inspired by the design research field and human-centered approaches, and then to give back by sharing their design work as design cases (such as in the International Journal of Designs for Learning [https://edtechbooks.org/-uLQ] ) and by publishing in design research journals . Allen, M. (2012). Leaving ADDIE for SAM: An agile model for developing the best learning experiences: American Society for Training and Development. Cross, N., Dorst, K., & Roozenburg, N. F. M. (Eds.). (1992). Research in design thinking: Delft University Press. Dolata, M., Uebernickel, F., & Schwabe, G. (2017). The power of words: Towards a methodology for progress monitoring in design thinking projects. Proceedings of the 13th International Conference on Wirtschaftsinformatik. St. Gallen, Switzerland. Floyd, C. (1988). A paradigm change in software engineering. ACM SIGSOFT Software Engineering Notes, 13(2), 25-38. Fox, D., Sillito, J., & Maurer, F. (2008). Agile methods and user-centered design: How these two methodologies are being successfully integrated in industry. Agile, 2008. (pp. 63-72): IEEE. IDEO. (2011). Design thinking for educators: Toolkit. https://edtechbooks.org/-HV. Kim, B., Tan, L., & Kim, M. S. (2012). Learners as informants of educational game design. In J. van Aalst, K. Thompson, M. J. Jacobson, & P. Reimann (Eds. ), The future of learning: Proceedings of the 10th International Conference of the Learning Sciences (Vol. 2, pp. 401-405). Sydney, Australia: ISLS. Lande, M., Sonalkar, N., Jung, M., Han, C., & Banerjee, S. (2012). Monitoring design thinking through in-situ interventions. Design thinking research (pp. 211-226). Berlin: Springer. Norman, D. A., & Draper, S. W. (1986). User centered system design. Hillsdale, NJ: CRC Press. Rouse, W. B. (1991). Design for success: A human-centered approach to designing successful products and systems: Wiley-Interscience. Royce, W. W. (1970). Managing the development of large software systems Proceedings of IEEE WESCON (pp. 1-9): The Institute of Electrical and Electronics Engineers. Schuler, D., & Namioka, A. (1993). Participatory design: Principles and practices. Hillsdale, NJ: Lawrence Erlbaum Associates. Turk, D., France, R., & Rumpe, B. (2002). Limitations of agile software processes. Proceedings of the Third International Conference on Extreme Programming and Flexible Processes in Software Engineering (pp. 43-46). Want to Know More about the Design Research Field So You Can Contribute? The Design Research Society [https://edtechbooks.org/-RAy] has conferences and discussion forums. Sign up for monthly emails from Design Research News [https://edtechbooks.org/-Rzg] to find out about conferences, calls for special issues, and job announcements. 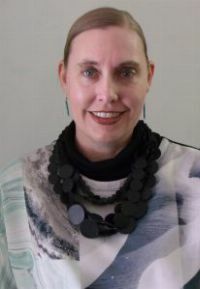 Dr. Vanessa Svihla is an assistant professor at the University of New Mexico with appointments in the learning sciences and engineering, and she directs the Interaction and Disciplinary Design in Educational Activity (IDDEA) Lab. Her research has been supported by the NSF and USDA, and she was selected as a 2014 National Academy of Education / Spencer Postdoctoral Scholar. Dr. Svihla received her MS (Geology) and PhD (Science Education) from The University of Texas at Austin. She served in the Peace Corps and was a post-doctoral scholar at UC Berkeley. She draws inspiration from her own practice in fashion design and instructional design, as her research focuses on how people learn when they design. She is particularly interested in how people find and frame problems, and how these activities relate to identity, agency and creativity.